Barbara Stanwyck (July 16, 1907 – January 20, 1990) [born Ruby Catherine Stevens] was an American actress. She was a film and television star, known during her 60-year career as a consummate and versatile professional with a strong, realistic screen presence, and a favorite of directors including Cecil B. DeMille, Fritz Lang and Frank Capra. After a short but notable career as a stage actress in the late 1920s, she made 85 films in 38 years in Hollywood, before turning to television. 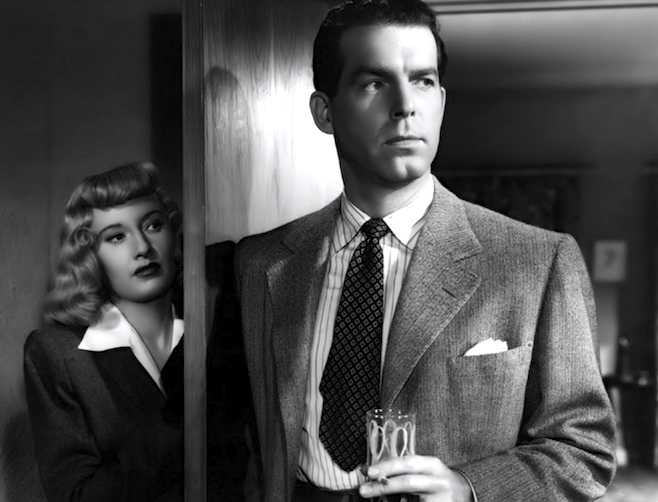 Double Indemnity is a 1944 American film noir, directed by Billy Wilder, co-written by Wilder and Raymond Chandler, and produced by Buddy DeSylva and Joseph Sistrom. The script was based on James M. Cain’s 1943 novella of the same title which originally appeared as an eight-part serial in Liberty magazine. The film stars Fred MacMurray as an insurance salesman, Barbara Stanwyck as a provocative housewife who wishes her husband were dead, and Edward G. Robinson as a claims adjuster whose job is to find phony claims. The term double indemnity refers to a clause in certain life insurance policies that doubles the payout in cases when death is caused by accidental means. A meet-cute is a term sometimes used to describe a situation in film, television, etc. in which a future romantic couple meets for the first time in a way that is considered adorable, entertaining, or amusing. This type of situation is a staple of romantic comedies, commonly involving contrived, unusual, or comic circumstances. The technique creates an artificial situation contrived by the filmmakers in order to bring together characters in a theoretically entertaining manner. Frequently the meet-cute leads to a humorous clash of personalities or beliefs, embarrassing situations, or comical misunderstandings that further drive the plot. The term is widely used by screenwriters. Billy Wilder uses it in a 1996 Paris Review interview, in reference to his 1938 screwball comedy film Bluebeard’s Eighth Wife, adding that the concept was “a staple of romantic comedies back then”. Film critics such as Roger Ebert or the Associated Press’ Christy Lemire popularized the term in their reviews. to meet cute: (in film-makers’ jargon, of two characters) to have an accidental meeting which leads to or is followed by romantic involvement. 1941 A. Boucher Case of Solid Key iii. 49 Last night was nice, but this is today. We met cute, as they say in story conferences; but people don’t live cute. 1956 G. Axelrod Will Success spoil Rock Hunter? 82 Irving: Dear boy, the beginning of a movie is childishly simple. The boy and girl meet. The only important thing to remember is that — in a movie — the boy and the girl must meet in some cute way. They cannot..meet like normal people at, perhaps, a cocktail party or some other social function. No. It is terribly important that they meet cute. This entry was posted on June 26, 2013 at 9:15 am and is filed under Adverbs, Idioms, Linguistics in the comics. You can follow any responses to this entry through the RSS 2.0 feed. You can leave a response, or trackback from your own site.